White dry Marsannay from Burgandy. It was designed to be a hot friday night crunch with a glass of white wine and some camembert to end with. Sardinettes, as it's written on the can means little young sardines , 8 to 10 in an average size can devoted to connoissers. And really I don't know what more one can expect of a sardine can : everything is just perfect, smooth and tasty without any oily feeling in mouth, perfectly dissolved bones… Just great ! The best I ate for a long time. 5 on 5 ! What shall I say to temperate my enthousiasm ? Could look better may be… And the sardines didn't taste as hot as I expected… Not hot at all in fact unless you dip bread into the oil. And even there, it's hot for a french taste, just a hint, that is to say not hot at all ! Really good for sardines, no need to add anything. And for sure, there is a difference between sardinettes - from the Atlantic ocean, and spanish sardinillas -from the mediterranean coasts, also called "poutine" on the Riviera and sometimes packed 20 in a can or even 50 in a wheel like big round can. 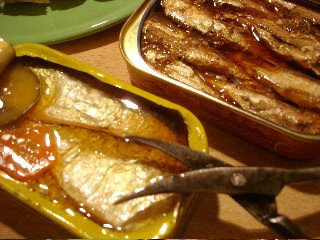 Nuri sardines are just the opposite : the sardine itself is really hot and the oil even more. 3 aged sardines in the can and displayed in the blue way as you can see… by opening it with special sardine scisors by the bottom (I collect cans and I eat sardines so most of the time I have to tear the bottom instead of pulling the ring ! And I'm glad I found this sardine can opener in an antiques shop in NY ! 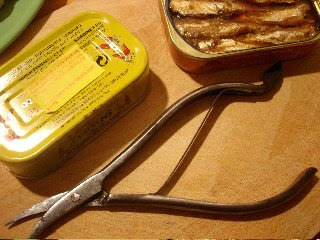 No kidding, it was sold as a sardine can opener before the removable lid was invented.) So you can see that Nuri sardines are displayed with white bellies facing the bottom, this being a taste falt would say a traditionalist canner. But 4 on 5 for the taste and 5 on 5 for the nice label. The camembert was a little too strong. I had to empty the whole toothpaste tube not to spoil the end of the night. 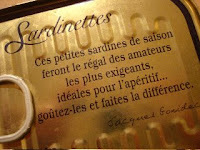 Sardines from Les Mouettes d'arvor are available and can be easily ordered through Jacques Gonidec or Penn Sardin. I enjoy reading your posts and love your passion for sardines. I'm guessing neither of those purveyors of sardines you mentioned ships to the U.S., at least not for less than a small fortune, no? 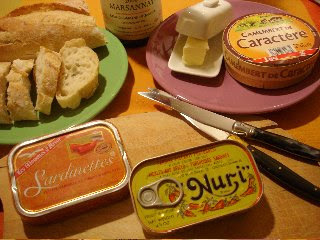 Gonidec is a small cannery but Penn sardin is only devoted to spreading sardines all over the world… I'll meet next week the lady from La Perle des Dieux and will ask her about that. Checking the site yesterday, there was written Postage offered until the end of the month. I think you should ask by yourself ! And I always felt that post office costs in France were not as expensive as in G.B. or U.S even for overseas sendings… Of course UPS or DHL cost much more… but are necessary only in case of emergency !